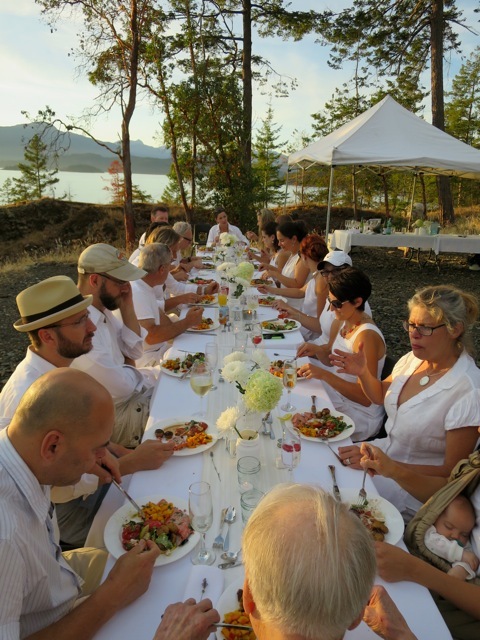 The community of Bowen Island can now be added as an honorary member to the 17 cities worldwide that collectively host over 15,000 guests for an annual Dîner en Blanc. Bowen residents Richard and Carrie De Jong caught the vision for turning this high-rolling, exclusive event into a local party for friends and community members. As they began planning, however, the De Jongs were struck by the reality that, for many people in the world, such a whimsical affair of beauty and decadence is a dream beyond reach. So they decided to put a little twist on their Parisian-style picnic. They selected the perfect spot, ordered banquet tables, and started putting out the word. It didn't take long for the guest list to rise to about 23 - some of whom hadn't even met before. On a gorgeous September evening, guests donned in crisp, white attire arrived at Cape Roger Curtis to a breathtaking sunset over the sea. 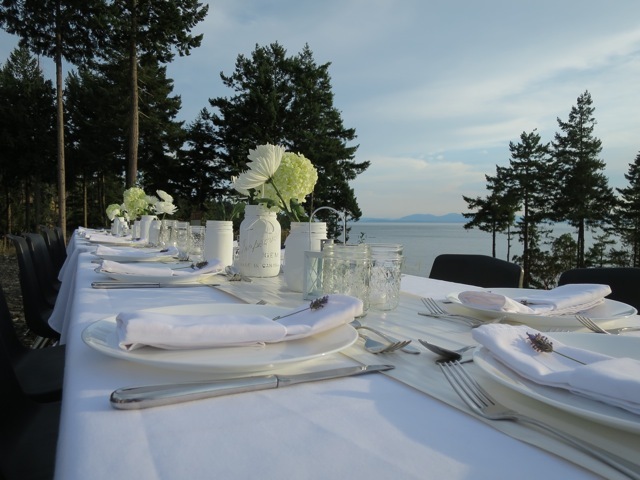 This picturesque setting became the perfect outdoor venue for the very first (unofficial) Bowen Island Dîner en Blanc. Richard and Carrie provided the salmon and coordinated guests to bring appies, side dishes, and desserts. Guests enjoyed comfortable conversation and delicious food, catching up with old friends and making new ones. The low-key but highly elegant event was a brilliant success. "People loved it, they were over the moon!" Richard enthused. During the meal, Richard shared about Cates Hill Chapel's involvement with Nebaj, a small community in rural Guatemala. Through Food for the Hungry (FH) Canada, Cates Hill has formed a close relationship with Nebaj and faithfully supports the community through Child Sponsorship, monetary donations, and personal visits. Richard showed a few pictures of the people he's met in Nebaj, and passed around copies of Hope Notes, the biannual FH magazine, so his guests could see what the broader work of development looks like with FH. Richard then put out a simple envelope and offered people the opportunity to give toward the work being done in Nebaj - this was the twist he and Carrie had in mind. It was a low pressure invitation, but the outcome was astounding! When Carrie and Richard counted the money at the end of the evening, there were $810 inside! "When you provide a non-threatening environment, people get excited about giving," Richard explains. Through the Bowen Dîner en Blanc, the De Jong's brought their community together around a fun function everyone enjoys - eating! They kept it small and manageable, but inclusive and classy. And they took the opportunity to bless another community in need of resources and encouragement. The De Jongs hope to return to Nebaj, Guatemala for another visit next spring. "The Cates Hill relationship with Nebaj is growing and becoming more meaningful," Richard shares. "Personally, I really see the benefit of visiting now. You get to see exactly how your money and efforts are at work, visit sponsored children, and meet with leaders and families. So often you give to a cause and really have no idea what the outcome is. But through this kind of partnership, you get to see direct, and personal, results." They hope to not only rally together people from their church, but to potentially include other community members who have a heart to help. Richard explains, "When you bring real needs to the community, people rally behind it." FH Canada sends its heartfelt thanks to Richard and Carrie De Jong, Cates Hill Chapel, and the community of Bowen Island - we love your style! To learn more about partnerships and team trips with Food for the Hungry, click here.